Here is a listing of sites and pointers to references which are of some particular interest to electro-acoustic loudspeaker design, to sound reproduction in small spaces and to listening enjoyment. It also refers to recording, music, amplifiers and other subjects of interest to me. The links are ordered chronologically from oldest to most recent on top, the way I posted them. This isn't a prelude to suddenly becoming active on FB but I felt I had to share this. Yesterday there was an AES session on mastering for high resolution (whatever that is) whose highlight was a talk about the state of the loudness war, why we're still fighting it and what the final arrival of on-by-default loudness normalisation on streaming services means for mastering. It also contained a two-pronged campaign piece for MQA. During it, every classical misconception and canard about digital audio was trotted out in an amazingly short time. Interaural timing resolution, check. Pictures showing staircase waveforms, check. That old chestnut about the ear beating the Fourier uncertainty (the acoustical equivalent of saying that human observers are able to beat Heisenberg's uncertainty principle), right there. At the end of the talk I got up to ask a scathing question and spectacularly fumbled my attack*. So for those who were wondering what I was on about, here goes. A filtering operation is a convolution of two waveforms. One is the impulse response of the filter (aka the "kernel"), the other is the signal. A word that high res proponents of any stripe love is "blurring". The convolution point of view shows that as the "kernel" blurs the signal, so the signal blurs the kernel. As Stuart's spectral plots showed, an audio signal is a much smoother waveform than the kernel so in reality guess who's really blurring whom. And if there's no spectral energy left above the noise floor at the frequency where the filter has ring tails, the ring tails are below the noise floor too. A second question, which I didn't even get to ask, was about the impulse response of MQA's decimation and upsampling chain as it is shown in the slide presentation. MQA's take on those filters famously allows for aliasing, so how does one even define "the" impulse response of that signal chain when its actual shape depends on when exactly it happens relative to the sampling clock (it's not time invariant). I mentioned this to my friend Bob Katz who countered "but what if there isn't any aliasing" (meaning what if no signal is present in the region that folds down). Well yes, that's the saving grace. The signal filters the kernel rather than vice versa and the shape of the transition band doesn't matter if it is in a region where there is no signal. These folk are trying to have their cake and eat it. Either aliasing doesn't matter because there is no signal in the transition band and then the precise shape of the transition band doesn't matter either (ie the ring tails have no conceivable manifestation) or the absence of ring tails is critical because there is signal in that region and then the aliasing will result in audible components that fly in the face of MQA's transparency claims. Doesn't that just sound like the arguments DSD folks used to make? The requirement for 100kHz bandwidth was made based on the assumption that content above 20k had an audible impact whereas the supersonic noise was excused on the grounds that it wasn't audible. What gives? Meanwhile I'm happy to do speakers. You wouldn't believe how much impact speakers have on replay fidelity. * Oh hang on, actually I started by asking if besides speculations about neuroscience and physics they had actual controlled listening trials to back their story up. Bob Stuart replied that all listening tests so far were working experiences with engineers in their studios but that no scientific listening tests have been done so far. That doesn't surprise any of us cynics but it is an astonishing admission from the man himself. Mhm, I can just see the headlines. "No Scientific Tests Were Done, Says MQA Founder". 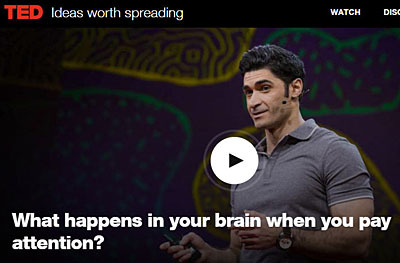 I thought you may be interested in this brief TED Talk if you have not already seen it. It describes an experiment looking at what happens in the brain when a subject is tasked with focusing on one of two visual elements (overt attention) compared to when tasked to focus between them (covert attention). I would suspect this would have strong parallels with audio stream segregation. 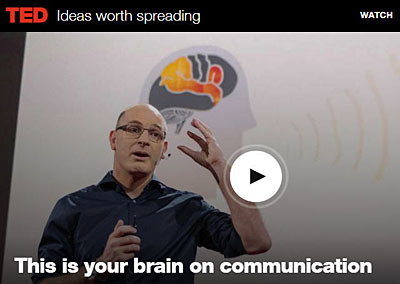 Neuroscientist Uri Hasson researches the basis of human communication, and experiments from his lab reveal that even across different languages, our brains show similar activity, or become "aligned," when we hear the same idea or story. This amazing neural mechanism allows us to transmit brain patterns, sharing memories and knowledge. "We can communicate because we have a common code that presents meaning," Hasson says. What is so special about vinyl? We had a big vinyl event here last Saturday; absolutely amazing, almost 200 people, about 1/3 of the doctors in Santa Rosa were here. We put on a great show, but I remained quizzical as to the outrageous major buzz that manifested unlike any other event we've had. I have preciously dwelt on this 'phenomenon' at some length, and concluded that the distortion family of vinyl is being re-embraced as an antithesis to the sound of highly compressed MP-3. Remember, you don't listen to a lot of terrible current pop music, but the masses do. But the reaction I picked up obviously went well past this one factor. Had a great Facetime chat w/ a brilliant friend of mine in Canada last night, talked about this. And then it hit me: the significance of ritual, and what happens when you take it away. The public is overjoyed returning to a ritualized recorded music playback. Yes, Craig, your thoughts resonate strongly with me. We all know that music can touch and move us at a deep level. And going through the preparations for playing a vinyl disc, then sitting down in anticipation, is like opening a perceptual door, paying attention, being ready to receive and to lose one's daily self. Streaming a concert by the Berliner Philharmoniker can have such an effect on me. I just started reading: 'Music, The Brain And Ecstasy - How Music Captures Our Imagination' by Robert Jourdain. Music with a Cochlear Implant? My "Loudspeaker System Design" articles were originally published in Wireless World, 1978, May, June, December. ".... Acoustic design targets based on data and parameters derived from single microphone measurements are therefore likely to have inadequacies and may be misleading. Overall this implies our current understanding and models of perceptual processes, including those involved with listening, have significant room for improvement and are likely to more fully develop over time. We should, therefore, be cautious of design based solely on room acoustic parameters given in current international standards (Lokki, 2013)." Abstract - The concept of Fresnel Zones arises from considering reflection paths off a surface differing from the direct sound propagation path by some multiple of half a wavelength. The modelling of these zones, and of zones derived using a set time delay, provides useful insights for the design of spaces for listening and communication. This paper gives an overview of analysis using this approach together with some examples and is intended as a companion paper to 'Room Acoustics for Listening'. The paper by Tore Skogberg illustrates the difficulties in analyzing and predicting diffraction effects. Added to that are the finite dimensions and modal breakup effects of real sources. But it is important to understand the general trends in order to design sensible baffle shapes and to optimize them by acoustic free-space measurements on-axis and around the cabinet. See also My Conversations with Fitz. InterComms talked to Ecma TC32-TG22's Convenor and Swissaudec's CEO Clemens Par about the 21st century's broadcasting and communication means. The pdf of the interview gives an introduction to the ingenious concept and methodology behind the Ecma-407 standard for down-mixing f-channels of audio into g-channels and then transmitting them using currently deployed codec's like AAC or HE-AAC. On the receiving end of the bit-stream transmission the g-channels can be up-mixed again to f-channels or a smaller number of h-channels depending upon the playback setup. The process has higher proven performance than UHD 3D-audio codec's currently under development. See the White Paper: ECMA-407 "Instant HD to UHD Audio". Clemens Par gives credit to Rudolf E. Kalman and Guenther Theile in the InterComms publication of: Rationalism versus Empirism - A Crash Course in Invariant Theory. Swissaudec exhibited in 'NAB Labs Future Park' at the 2016 NAB Show in Las Vegas. I am a personal friend of Clemens Par, having met him first at TMT26 in 2010, where I was mightily impressed by his process for up-mixing a mono audio signal to stereo as if recorded with a MS coincident microphone pair. Since then much more powerful applications have evolved out of Invariant Theory and inverse coding. But it pains me to see how established audio standard setters resist to accept and incorporate the new paradigm. See also Rationalism and swissaudec GmbH below. 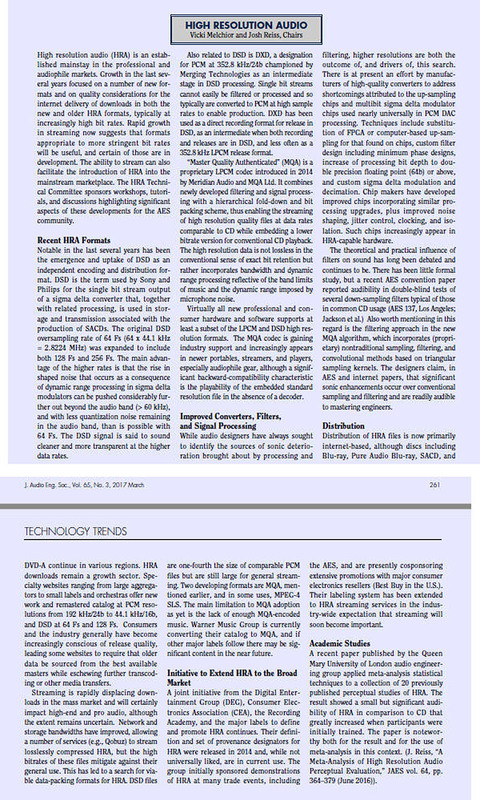 The Feature Article by Francis Rumsey in the April 2016 issue of the Journal of the Audio Engineering Society ends with a section about THE BENEFITS OF BINAURAL LISTENING IN REVERBERANT CONDITIONS (copy on left). Auditory stream segregation is at play when the listening room and the loudspeakers in a proper stereo setup recede from perception and are moved beyond the acoustic horizon of the listener. "Humans evolved while listening in reflective spaces, and are comfortable listening in them. In fact, it is now widely recognized that we perceptually "stream" the sound of the room as separate from the sound of the sources - that is what happens in live performances. A Steinway is a Steinway; only the hall changes. Performance halls generally don’t have room mode problems because they are so large. The parallel situation in sound reproduction is that a good loudspeaker is a good loudspeaker, and its virtues are appreciated in a wide variety of rooms – except for the differences in the bass region." "As an illustration of how much loudspeaker technology has improved over the years, these data on the JBL Pro M2 indicate that whatever one’s opinions of loudspeaker/room interactions were in the era of the UREI, they cannot be the same in the era of the M2, and any similarly “neutral” loudspeaker. Because it is desirable that the direct and reflected sounds resemble each other, the newer loudspeaker has an enormous advantage. Traditions need to be put into context, and some of them relegated to history." I just wish more speaker designers would take seriously the implications of the highlighted statements above. See also a more recent article by Floyd "What do listeners prefer for small room acoustics?" 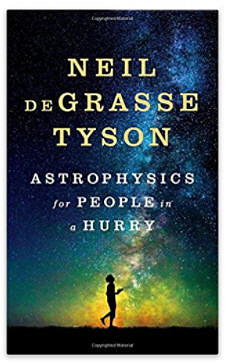 Here is an easy to read book, written by a neuro-scientist for the general public, which describes the response of the ear/brain perceptual apparatus to sound, to what draws our attention, affects our emotions, our memory and possibly our actions. I highly recommend this book to anyone involved with sound, whether in production, rendering or listening. My loudspeaker designs for creating convincing auditory illusions in ordinary rooms are intentionally based on evolutionary hearing processes as described by Horowitz. Diego Ivars Morón's Master's Thesis at the Norwegian University of Science and Technology deals with different approaches to obtain very wide dispersion from the tweeter section of an otherwise omni-directional loudspeaker. Conventional box loudspeakers very often suffer from spurious sound radiation, which is caused by the mechanical vibration energy of the drivers being transmitted into the cabinet and exciting the cabinet walls to vibrate at certain panel resonance modes. Furthermore, the high sound pressure levels inside the cabinet can excite panel modes. Since the cabinet's radiating surface areas are usually much larger than the driver cone area even relatively small panel excursions can lead to significant spurious acoustic output. Depending upon the cabinet construction the output might even be larger at certain frequencies than the desired output from the driver. In addition, air borne acoustic energy inside the cabinet, which is very difficult to absorb and to turn into heat will escape via the thin cone material of the driver and can color the sound. These problems taken together and combined with a sub-optimum radiation pattern generates the generic box loudspeaker sound. 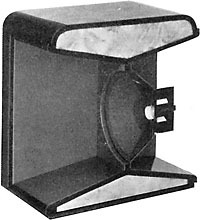 Conversely, an acoustically small, open-baffle (dipole) loudspeaker with its minimal baffle area and no box enclosure is largely free of spurious emission problems. The Open Access AES paper "Predicting the Acoustic Power Radiation from Loudspeaker Cabinets: a Numerically Efficient Approach" deals with acoustic radiation due to structure borne vibration energy in a highly braced cabinet. It is an interesting read and shows how much attention must be given to cabinet details to minimize spurious emissions. The Hauptmikrofon.de website was updated by Helmut Wittek (Schoeps) and relaunched in 2015 with an emphasis now on 3D audio. 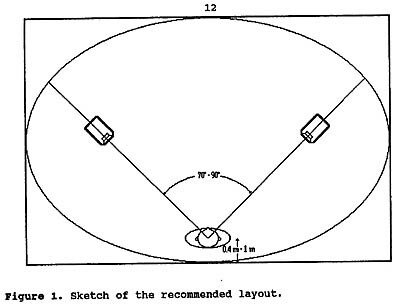 Unlike WFS or Ambisonic approaches that aim for exact physical reconstruction of the recorded soundfield here are microphone arrangements described, which exploit the psychoacoustics of hearing and Gestalt recognition as originally described in the groundbreaking work by Guenther Theile. While the emphasis is on microphones and their characteristics on the sound recording side, little is said about loudspeakers and rooms, which after all are the other half of the story on the sound rendering side. As far as I know conventional box loudspeakers have been used to assess the recording techniques. This can only be justified by their popularity. But if optimum 3D rendering is the goal then also loudspeakers, their characteristics and setup, and the room have to be revisited! This publication by Clemens Par of swissaudec in Issue 25 of InterComms is a tribute to Professor Rudolf Kalman and was inspired by conversations between them. It is also a tribute to Guenther Theile's groundbreaking work in auditory spatial perception. 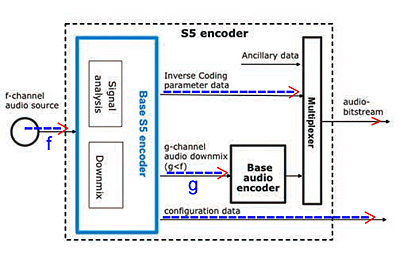 Their mathematical contributions to systems and invariant theory combined with new understanding of cerebral spatial hearing processes have led to new forms of audio coding as now standardized in ECMA-407 for UHD 3D audio. In this YouTube video Charlie Gillingham (2015 NuPIC Hackathon) talks about the challenges in machine decoding MIDI files, whereas the human brain's Hierarchical Temporal Memory (HTM) has few difficulties with audio stream segregation. See also the talk about Machine Intelligence below. Stream analysis and segregation is a fundamental process of the brain. For example, when listening to a pair of loudspeakers segregation between direct streams and room reverberated streams is made easy or difficult by the loudspeaker setup and their radiation pattern and leads to the creation of different phantom scenes in the listener's brain. Jeff Hawkins of Numenta gives a fascinating talk about pattern recognition in the brain. I take from it that the change in sensory input data streams with movement (temporal), for instance with eye movement in vision and head movement in hearing (= changing HRTF), is fundamentally tied to how we process perception of the world around us. 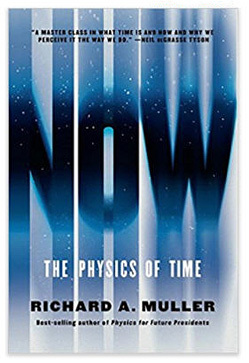 "Principles of Hierarchical Temporal Memory (HTM): Foundations of Machine Intelligence"
At the 2015 California Audio Show Nelson Pass talked about power amplifiers and how he sees his role of being in the Audio Entertainment Business, i.e. where different design approaches satisfy different customer's tastes and demands. He has been eminently successful with his products, which are knowingly designed to sound good, to last forever, with rare model changes, and which are readily serviced in the unlikely event that they ever need it. Nelson ran out of time for his talk. What he covered is written up at firstwatt almost verbatim. See also the stereophile CAS6 summary of his talk. 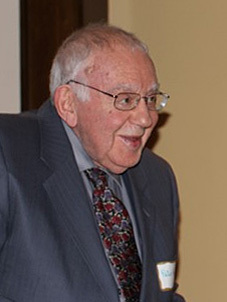 "24/192 Music Downloads ....and why they make no sense"
See also from CNET: "Sound bite: Despite Pono's promise, experts pan HD audio"
"Kreuzverhörtest: Der c't-Leser-Hörtest: MP3 gegen CD"
A month before his 89th birthday Peter Aczel published his Audio Legacy ending a long obsession with no nonsense and trustworthy audio journalism. My contacts with TAC began when I responded to Floyd Toole's article in No. 28 with a letter to the editor, which was published in No. 29 and to which Peter Aczel responded with a challenge to send him one of my open-baffle designs to test my claims. 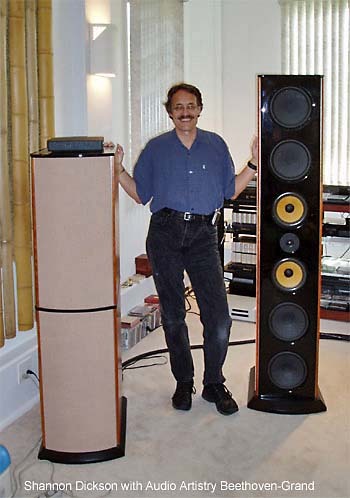 Don Naples of Wood Artistry build a pair of ORION speakers for him. Don Barringer helped to set them up and tweaked them to his "Subjective Neutrality" version in later years. Still, Peter could not resist to also eventually own the LX521 built by Dr. Frank Brenner, thus following the progress that has been made since his initial challenge to me. Congratulations, Dear Peter, on your 89th! I wish you many more years of acceptable health, companionship with your wife and joyful listening to come! A well deserved trust in your reviews and opinions has convinced many to build ORION, PLUTO or LX521 speakers. Thank you. Floyd Toole, retired from heading R&D of the Harman Group, continues to educate about loudspeakers in rooms. Here is a recent lecture at CIRMMT on YouTube. As always he gives a lucent presentation, arguing for a flat on-axis frequency response, non-resonant behavior and a smoothly controlled directivity index, e.g. JBL M2. According to my observations/conclusions he does not go far enough towards constant directivity and only talks about box speakers, which always start out as omnis at low frequencies and have associated room resonance issues. See also Francis Rumsey's talk about Spatial Audio below. In its early stages Prostate Cancer usually has no symptoms. PSA testing is the best way to find Prostate Cancer early. This may help save your life. A simple blood test can determine your PSA (prostate specific antigen). Doctors recommend that your PSA be determined beginning at age 40 (35 if you have a family history of Prostate Cancer or are African American). Retest regularly based on your doctor's recommendation. The PSA Test is as important to men as the Mammogram is to women. On his Neurochrome Audio website Tom Christiansen describes and offers solid-state and vacuum tube power amplifier designs, circuit boards and construction plans for DIY. Power levels are well suited to my LX series speaker designs. Specifications are excellent but I have no listening experience with such low levels of distortion. My requirements usually stop when harmonic distortion is <0.01%, damping factor >20 and associated power supplies are able to deliver adequate voltage or current peaks for high level transients. Most importantly, the amplifier must not go into spurious oscillation, or DC output generation, or other misbehavior when internally voltage or current clipping. My active crossover, multi-channel loudspeakers put much less demand on the individual amplifiers, than the typical n-way passive crossover speakers that are common place, because each amplifier sees a benign load made up of the speaker cable, the voice coil impedance and the motional back emf. But still, it would be rewarding to find out that even more realism can be gained from the LX's when Neurochrome amps are used. Christopher Kissel writes to me: "....Listen to the examples on the MEDIA page of my website as well as the samples that are available on the three compact discs that are linked to on the NEWS page of my website. My interest is in stereo upmixes which include distinct, stable separation of vocal and instrumental elements from the original mono source, i.e. stereo mixes that sound like they were created from multi-track session tapes, had they existed...."
He states: "Mono is a form of distortion". I agree. It is spatial distortion, which his upmix to pan-pot stereo removes to a high degree. To me pan-pot or multi-track mixes are still distortions of the spatial context in which natural sounds always exist. Furthermore, listening to the examples I have the impression that new, unpleasant timbre distortions have been introduced. Without hearing the original mono version I cannot tell which form of distortion I would prefer to live with in order to enjoy the musical content of the old mono recordings. But the technology presented here is certainly a big step up from earlier attempts to add spaciousness to mono recordings. He points to the limitations of listening tests, including ABX tests. The problem is plasticity of the brain. Perception depends upon brain processes, which are not stable with time. Personally, I rely on listening over time, not quick A/B comparisons, which require close attention. The attentive part of the brain tires readily and falls for (auto)-suggestions. The subconscious part of the brain is always active in survival mode. In long-term listening it tends to brings up to my attention what it hears as unnatural. But only if it is regularly refreshed with natural sounds. I find myself in agreement with Masciarotte's observations. A very comprehensive and readable guide to everything digital in audio recording, processing, storage, transmission and playback. Sixteen authors contributed to this collection of review articles covering some of the most relevant areas of communication acoustics. Much is about scientific understanding of how we hear and how to model it for further study. I am fascinated by implications to the design of loudspeakers for rendering a convincing auditory scene in acoustically small reverberant spaces. "As we all know, the behavior of human beings is not guided directly by the acoustical signals that we provide them with, e.g., like a reflex, but rather by the "meaning", which is transferred via those signals. Consequently, an important demand of advanced communication technologies is to gain information on how human beings interpret acoustic signals on the background of their individual situational and background knowledge, i.e. what the signals actually mean to them." "The term cocktail-party effect denotes the fact that human listeners with healthy binaural hearing capabilities are able to concentrate on one talker in a crowd of concurrent talkers and discriminate the speech of this talker from the rest. Also, binaural hearing is able to suppress noise, reverberance and sound coloration to a certain extent." View the discussion on YouTube. In addition to my observations about externalizing headphone reproduction, I want to emphasize that it is the change of the HRTF with head movement that strongly helps to externalize and not just the stationary HRTF by itself. (Note that all our senses - seeing, hearing, touching, tasting, smelling - are primarily change detectors.) Furthermore, externalization can be learned and retained at least for a while. Thus I can envision turning a smart-phone in combination with head turning and changing the ear signals as a brain training procedure for 3D listening to stationary HRTF encoded program material. Someone ought to try this. The 3D rendering over headphones (without head tracking) that I have heard so far produces far too much distance foreshortening to sound spatially realistic. Last night I attended a variety of performances under the title EXTREMITIES in San Francisco Symphony's new SOUND BOX. It was an exciting event. Of particular interest to me was the installed Meyer Sound Constellation Acoustic System, which I had never heard before. It performed exceedingly well in giving the venue different acoustics, appropriate to the style of music being played by the musicians or sounds being rendered. But unlike other spatial sound enhancement systems, which pick up the musician's sound with nearby microphones and then convolve the signals with the impulse response of some other venue, delay them and play them back over multiple distributed loudspeakers in the hall as reverberated sound, the Constellation system works with the hall itself. There are no microphones dedicated to the musicians, but there is an overhead matrix of widely spaced microphones covering the whole venue. There is a widely spaced ring of loudspeakers up and along the walls and also loudspeakers overhead. I think individual microphones feed nearby loudspeakers in such a way as to avoid acoustic feedback and in such a strength as is desired for the musical performance. Thus the venue can be changed from being quite dead to church like acoustic proportions and also be different from one end of the hall to the other. For example a group of singers walking in from one end of the hall can first sound quite distant and then become gradually nearer sounding as they approach the stage. 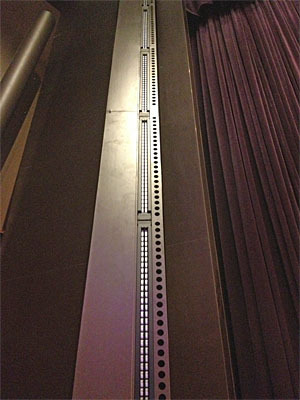 The significant feature of the Constellation System is that each microphones picks up the direct sound at its location generated by the performers and the diffuse sound in the hall. This mix is processed and played back over adjacent loudspeakers at a desirable level. 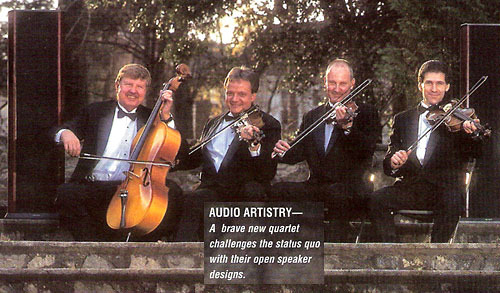 The musicians are free to move as in a natural acoustic environment. Ensemble play seems to be working fine. Not everything was perfect, though. The violins in a small ensemble playing Ravel were barely audible from my close seat while the harp was overpowering. I suspect the acoustically open and dead space behind the group of musicians, which was hidden behind a huge projection was to blame for a lack of primary reflections. Violins on a different stage in the Monteverdi piece sounded strong. I am sure more fine tuning will happen to this remarkable SOUND BOX. THE NEW YORKER writes about the Meyer Sound Constellation Acoustic System and the SFS SOUND BOX. For a different approach to changing hall acoustics see "Recording in a virtual acoustic space"
Spatial Audio - Reconstructing Reality or Creating Illusion? 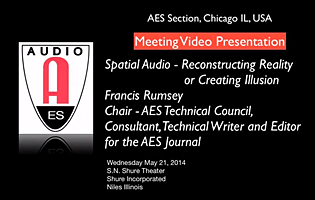 At the May 21, 1994, meeting of the Chicago AES Section Francis Rumsey gave a presentation entitled, “Spatial Audio - Reconstructing Reality or Creating Illusion?” Francis Rumsey is an independent technical writer, editor of the JAES and consultant based in the UK. 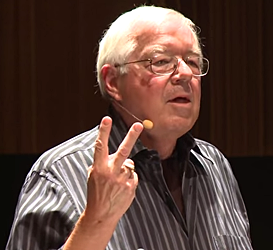 After Bob Schulein introduced him as “knowing a lot about a lot of things,” Francis began his presentation by indicating that for over 100 years, a battlefield has existed between those that want sound to be an accurate reconstruction and those that want it to simply sound nice. Only 5% of the recordings sold in the commercial market are actually made in a “natural space”; 95% percent are “manufactured” in the studio. 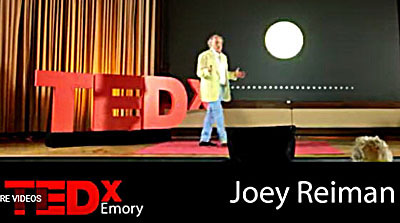 Francis Rumsey’s presentation is now posted on YouTube . 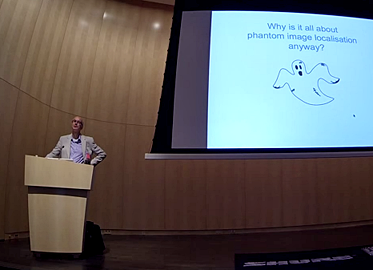 I find myself in full agreement with Rumsey's presentation of spatial perception, but miss a discussion of the perceived distances of phantom sources. Distance is a separate perception from direction and evolutionarily speaking as important as direction. In the case of 2-channel stereo we naturally localize each speaker in its environment by head movement and HRTF changes and from it the ear-brain apparatus receives cues about the distance to the speakers and thereby about a minimum distance to any perceived phantom sources. Such phantom sources even stay in their locations with head movement. We draw perceptual cues about greater distances from the program material and its recorded venue reverberation, and from playback volume. In order to clearly localize and then to perceptually withdraw attention from speakers and room, the reflections from the speakers must be delayed and diffused, and be similar in timbre to the direct sound. If the speakers are highly directional, like large horns, and the room is acoustically dead, then a phantom center voice can be perceived in front of the plane between the speakers. In that case we are approaching earphone listening, for which the phantom source is localized inside the listener's head. With earphones, and without head tracking, it is probably impossible to perceive frontal phantom sources at realistic distances outside of the head. Whispering into the ears works really well with earphones, but not at all with loudspeakers. Distance issues show up similarly with WFS, 22.2 or Atmos surround systems, where the loudspeakers define the plausible distance of the acoustic event from the listener, who seemingly sits in an acoustically empty ring or tent formed by the speakers. In this context it is also of interest to read 10. SOCIAL PERCEPTION OF 3D AUDIO from AES 137th Convention Paper #9218 titled: "ECMA-407: New Approaches to 3D Audio Content Data Rate Reduction with RVC-CAL". The freeDSP is a low-budget open-source audio-dsp (digital signal processor) module for the do-it-yourself community. The applications range from active loudspeaker concepts (digital crossovers, bass enhancement, ...) and room equalization over steerable microphone arrays to advanced effect processors. It's open-source: The freeDSP board is published under a creative commons license (CC-BY-SA). It allows the unrestricted use and modification of the module. Easy programmability with SigmaStudio. No advanced coding skills are necessary. The freeDSP works with a free graphical development environment. The programming model is function-block based. Just drag-and-drop some processing blocks and virtual cables - and you are ready to go! 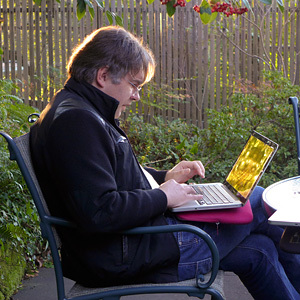 Ruediger Franz Rauskolb, a former colleague at HP and longtime friend, sent me "My Life's Journey through Audioland", in which he says: True to the spirit of “copy left” I would like to propose the opening of an open source project. The outcome would be a design that is available to anyone free of charge, or based on donations. There would be no proprietary component in this. Rather than competing with each other, in order to get the ego satisfaction of coming up with the worlds best design, I would like to work as a group working together for a common goal, deriving not ego satisfaction, but something possibly much more satisfying in the end, the knowledge of having contributed to the common good. This may enable a broader section of society being able to enjoy listening to pure music for their own healing and benefit, rather than satisfying the upper 1% of society, being able to afford ever-increasing prices for audio equipment. At this year's International Broadcasting Convention in Amsterdam, IBC 2014 - IBC Future Zone, the world’s first 3D audio standard will be showcased by swissaudec at Stand 8.F38. The ECMA-407 standard extends known audio codecs, to provide an unrestricted 3D experience up to NHK 22.2 at bit rates of 256kb/s and below - and simultaneously to mobile devices down to 48kb/s via a generic VOICODE® "app" and state-of-the-art binauralization. P1-7 ECMA-407: New Approaches to 3D Audio Content Data Rate Reduction with RVC-CAL. The new "inverse coding" methodology will be highlighted. The Harman Group has produced a movie in which musicians and audio producers lament the loss of quality when their art is delivered in MP3 format, compressed and streamed. I think compression is the primary problem and not lossy coding, if the data rate is greater than 128 kbps. They also point to glossy headphones, earbuds and portable devices as contributors to the sad state of sound reproduction. I suspect that the master tapes are already compressed and distorted for minimum dynamic range and maximum continuous loudness. I listen, and often with great satisfaction, through my loudspeakers to streamed music from European broadcast stations and others using the TuneIn Radio application and selecting the highest bit rate offered (>128 kbps). Francis Rumsey and Tim McCormick have given us with the 7th Edition an excellent reference for reading up on the art and science of recording, as it is practiced in 2014 with analog and digital tools. The 655 page book is well organized, clearly written and illustrated with easy to understand graphics. writes John Watkinson in the July 2014 issue of The Register. A timely, interesting, mostly to the point, but not conclusive article about the state of the loudspeaker industry. In the current issue of the Journal of the Audio Engineering Society (JAES Volume 62, Issue 6, pp. 454-455; June 2014) Floyd Toole asks: "Is it time to put Sabine in his place?". It is about time that the audio industry and academia address the loudspeaker and room compatibility issue for domestic size reverberant spaces and recognize it as just one more problem area in the transmission path from microphone membrane to eardrum. The brain takes over behind the ear drums, creating the perception of an acoustic event in some form of 3D space. The perceived scene is spatially distorted due to the directional characteristics of microphones and their distances to sound sources, and due to the directional characteristics of loudspeakers and their distance and azimuth to the listener. The microphone output signals contain a limited and specific view of the original acoustic scene. On playback the loudspeakers illuminate the listening room. The resulting eardrum signals consist of superimposed streams of air pressure variations arriving from different directions. With two ears, a movable head, a brain and a mind, evolution has formed a superbly capable perceptual apparatus, which automatically sorts a plurality of sound streams for direction, distance, meaning and for focusing attention. Loudspeakers and room (also the room behind the speaker membrane) must not provide misleading cues to a listener's brain in order to fully hear the information contained in the microphone signal streams and to instinctively withdraw attention from loudspeakers and listening room. The result is a convincing auditory illusion. The job can be done. It has been done. A simple stereo system can render in an ordinary room a more convincing 3D illusion than conventional multi-channel surround setups, because it can put perception at ease. Why has the audio industry not caught on other than trying to put patches on the problem for decades? I just discovered that my Oppo BDP-105 Blue-Ray Player lets me subscribe to live and archived concerts of the Berliner Philharmoniker. Acoustical and visual quality of the transmissions is excellent and fully matches the musical performances. If you love symphonic music or want an introduction to it, I cannot think of a better avenue. Concerts sound wonderful over the LX521 or the LXmini. You may be interested to know that I have designed a line array dipole for a Concert Hall sound system and this has now been completed. The system consists of 6 x 1m high Radia Pro 1.0 elements per side with a 5 x Seas bass drivers in dipole cabinet handling frequencies below 150 Hz. In addition to this are two dipole satellite bass cabinets, one under the main floor and one under the balcony seating to augment bass at these locations (the columns are effectively a line source whereas the bass falls as per a spherical source). The seating is flown/open which allows this. Filtering and crossover tasks were handled by 6 x Hypex DLCP units and 6 x Joe Malone Audio multichannel amps. The bass cabinets are directly under the stage below the column array. the holes you can see in the column housing were to move the first dipole null as high as possible. The satellite bass cabinets have been delayed so that even though you can feel (yes feel) their effect you still locate the stereo image frontally to the stage (55msec delay to the stall underseat, bass and 95 msec delay to the balcony underseat bass). Very even response with minimal changes between positions in the audience areas, stalls and balcony (you can also stand very close to the system without it being excessively loud). The null of the system points diagonally across the stage. Stage located source and image - one of the goals of the design was to have an soundstage at or near the actual stage. Locating the system on the stage and having very consistent horizontal directivity allows the early reflections to be similar to the stage acoustic sources and this also is important for making the system less obvious. To test the transparency of the system during the orchestra performance I fed a bridge pickup from a double bass into it and panned it to approximately the same location as the double bass was on stage - no one I asked was aware that there was any involvement of the sound system in the performance. This was exactly my intention, subtle reinforcement of acoustic performances if they need some help. One aspect that was 'discovered' when I was eq'ing the columns was that they do not revert to dipole behaviour as readily as I was expecting - you are still effectively very nearfield even a couple of metres back - this made the determination of the dipole correction less straightforward than I was expecting as once further into the Hall the room reflections then started to cloud the measurements. Also interesting was the difference in spatial quality between tapering the columns in level and not (for the taper I used, from the bottom column, -6dB, -1.4dB, 0dB, -1.4dB, -6dB, -15.6dB). The tapering notably improved the sense of space in recordings or it may be that the image is just unnaturally big without the tapering. Its a little bit difficult to photograph the array and it is also fairly innocuous, something I wanted. The photo shows how in-situ the array is tilted back (to approximately match the audience slope) with a toe-in of 24 degrees so that each column covers the entire seating area. This also directs the null towards the middle of the stage. The holes in the 'baffle' were used to shift the first dipole response notch to as high a frequency as possible and also to blur the distance to this edge. Lots of fun and it does sound pretty respectable! Played some Bucky Pizzarelli in your honour. 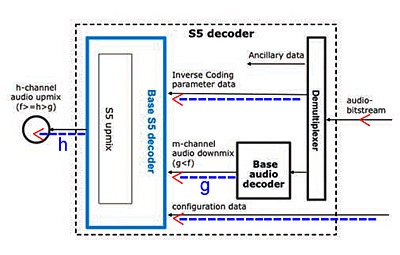 This Application Note from Agilent contains the most complete descriptions and illustrations of DAC performance issues and of the reconstruction of sampled signals into analog waveforms that I have seen. I highly recommend to download the free AN if you want to deepen your understanding of sampled waves, DAC's and associated distortions and artifacts. What is audibly significant is still another matter and often not obvious from graphics of electrical performance presented to the eye, but can become a resource for marketing claims. A large collection of material about the development of High-End Audio from 1960 until today can be found on this German website. Read my assessment of this development particularly as it relates to loudspeakers. A good friend of mine, Craig Allison, has started a website to raise awareness of the health value of regular listening to good music. I just came across this website while searching for 'Loudspeakers in the Sixties' and found "The Art of Speaker Design" written by Lynn Olson. He was and still is much involved in DIY audio. The website makes for stimulating reading as Lynn digs deep into everything. The website of the VDT carries the conference announcement. The Call for Contributions also includes "Binaural technologies". One would hope that not only earphone related topics are discussed but also problems and solutions to rendering 2-channel recordings over two loudspeakers in reverberant spaces. This subject matter deserves new investigation, because its full potential has not been recognized. I see the LX521 as a tool to demonstrate what is possible in terms of spatial rendering and musical realism from two loudspeakers in normal living spaces. Tonmeisters/recording engineers should listen to the LX521 at home, in their living space, for enjoyment and also for critique of what they accomplished with their monitors in the artificial acoustic environment of their work station. The VDT website now provides access to all the conference papers. By clicking <Tonmeistertagung>, <26th Tonmeistertagung 2010>, <Congress>, <Fr, Nov 26th 2010 a.m.> and scrolling down to 'PE: Perception & Esthetics' and then 11:30 - 12:00, you will find my paper "Hearing Spatial Detail in Stereo Recordings". You could go on this website to Publications #33 and find it there. See a 1923 "omni" loudspeaker by searching for Seibt TL11. It's probably more like an upward facing cardioid. The first radio that I successfully took apart and understood as to how it functioned was a Seibt DKE38 Volksempfaenger. This is a fascinating website if you are interested in old equipment. The Music Animation Machine - "Music Worth Watching"
A graphical presentation of sound streams, which are superimposed at the ear drums as sound pressure vibrations and which are deciphered in the brain as belonging to individual sources. From temporal and spectral differences between the ear signals for each stream and with head movement we localize direction and distance to the origin of that stream in the presence of other streams, reflections and reverberation. Surely an amazing accomplishment, but necessary for survival. An easy to follow, yet technically solid text, which covers in short chapters almost every subject that is related to sound recording. Written by McGill University educated Geoff Martin, PhD, it can serve as a tutorial and reference for aspiring Tonmeisters and professional or amateur recording engineers. A few chapters will still be completed or added to this web-based publication in the future to keep it up-to-date. Your donation for permission to download the PDF supports a worthy cause. 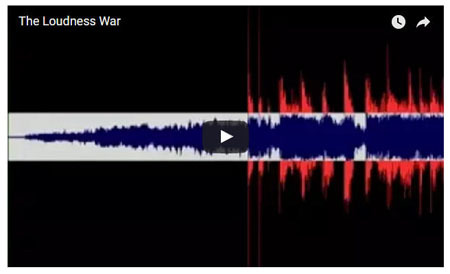 The Etymotic Audio File from May 2013 carries a well done educational video: Watch the Ear in Action. Publications of Linear Audio are found at www.linearaudio.net. Volume 5 is now available. Jan Didden's personal website is www.linearaudio.nl . Of particular interest to the LX521 DSP Challenge is his 6-channel volume control for the Behringer DCX2496, which could make this DSP unit a contender. On the LISTENINC website's Literature pages I found an interesting AES Convention paper by Steve Temme et al. with the above title. It shows the development of time-frequency-energy analysis of loudspeakers from the Short Time Fourier Transform to Cumulative Spectral Decay analysis to Wigner-Ville Distribution, Smoothed WVD, and Continuous Wavelet Transform. The graphical presentations for the different analysis methods are exemplary in showing relationship and resolution of the three variables for the same test object, a wide bandpass filter with resonances, and for interpreting the graphics. The KLIPPEL website is a rich source of educational material about the measurement, analysis and and detailed behavior of electro-acoustic transducers in the form of papers and application notes. Now it is also possible to take online training. The first of seven sessions has been posted. The January 28, 2013 issue of THE NEW YORKER carries on pages 32 to 39 a most interesting article by Adam Gopnik about "The quest for 3-D recording and other mysteries of sound". It puts in perspective Edgar Choueiri's cross-talk-cancellation experiments for 3-D listening at Princeton University with the hearing and sociological research at McGill University by Albert Bregman (Auditory Scene Analysis - The Perceptual Organization of Sound), Daniel Levitin (This Is Your Brain on Music) and Jonathan Sterne (MP3: The Meaning of a Format). The article highlights the changes in music consumption from the audience in a concert hall to the audiophile sitting in front of his speakers, in the sweet spot, and to the ear-bud generation busy with other activities. "The notion of a pure musical experience is, for Sterne and his cohorts, the last sad effort of a nineteenth-century cult of attention that placed the solitary alienated (and almost always male) listener in a temple of silence, the concert hall." The BBC has published "A Guide for Musicians" on how to protect their hearing. The information has relevance to the audiophile. My technical quibble is with the lack of definition for 'Sound Intensity' and 'SPL' and their use. Sound Intensity is sound power per unit area. A +3 dB change means doubling the power. The corresponding change in sound pressure level, SPL, is also +3 dB. Doubling the SPL, which is a +6 dB change, requires +6 dB or 4-times more power. Our ears respond to and can be damaged by the sound pressure level, SPL, at the eardrum. I am very much interested in the spatial rendering of stereophonic program material, in the illusion created in the listener's mind. Peter Huebner goes much deeper than that when he talks about dynamic space stereophony and how music is heard in the mind of a classical composer. It is not clear to me how that could be recreated as a listening experience, but the thought is intriguing. Maybe specific multi-channel program material and a combination of multiple real and phantom sound sources with specific directional properties would approximate the composer's experience. Anyways, the pages provide a profound view of music and its possible effects upon a listener. An animated illustration on the Sennheiser website shows the transfer of acoustic vibrations to electrical stimuli, which are then processed in the brain. The phantom sources that we hear between the loudspeakers of a stereo system are a construct of the brain. They are derived from the superimposed sound waves of left and right loudspeakers and the room at each ear. Cross-talk is essential for producing timing cues, which the brain uses naturally for directional hearing below 800 Hz in the Interaural Time Difference (ITD) range of hearing. Frequency response shaping by the outer ear and head blockage of sound are essential for directional hearing above 2 kHz in the Interaural Level Difference (ILD) range of hearing. Cross-talk cancellation in this frequency range can improve the spatial detail of the perceived acoustic scene and particularly its proximity. With HRTF derived CTC the two loudspeakers can be heard almost as whispering into just one ear from close-up. But maintaining a spatially uniform spread of the phantom scene in front of the listener becomes problematic when CTC thins out the center of the phantom scene. I have not heard CTC processing that I prefer long-term over plain stereo. 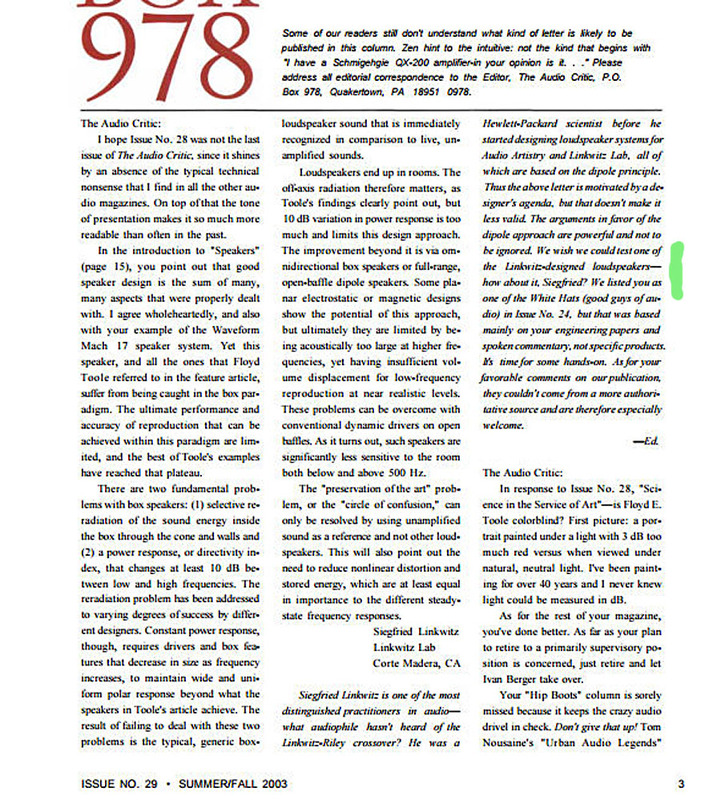 The Opinion Page of the New York Times Sunday Review carried on 11 November 2012 an article about listening vs. hearing by the author of the book. This subject is of particular interest to me, because in sound reproduction we ideally only pay attention to the direct sound from the loudspeakers, while reflections, reverberation and standing waves due the room's boundary surfaces are background sounds that can be tuned out. I am convinced that this ideal can only be achieved by using loudspeakers with frequency independent directivity. But this type of loudspeaker is not common and requires special effort to design. Instead, some people listen in acoustically dead rooms, which must be specially designed, rather than in more normal living spaces. See also This Is Your Brain on Music below. 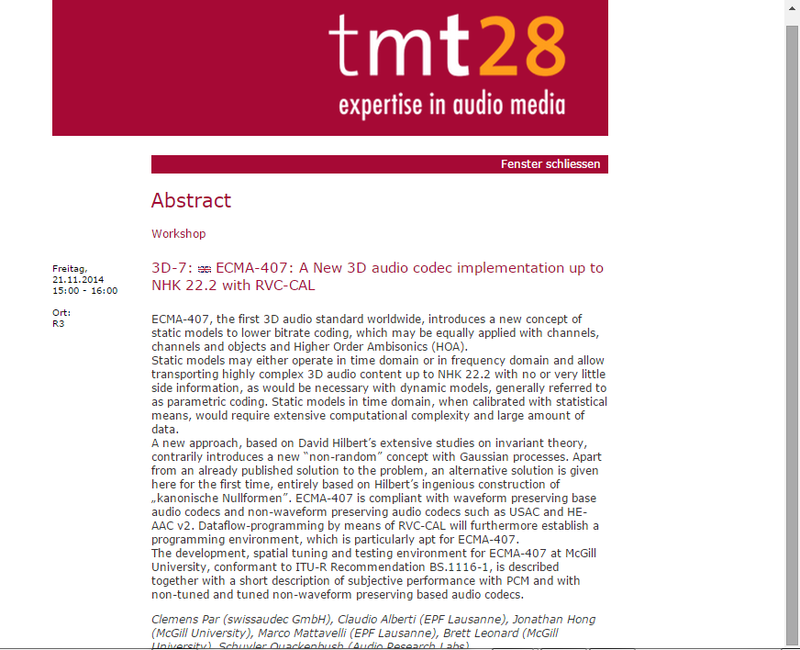 Clemens Par, founder of swissaudec, presents at tmt27 for the first time a paper about his ground-breaking and patented new methodology for audio signal coding. 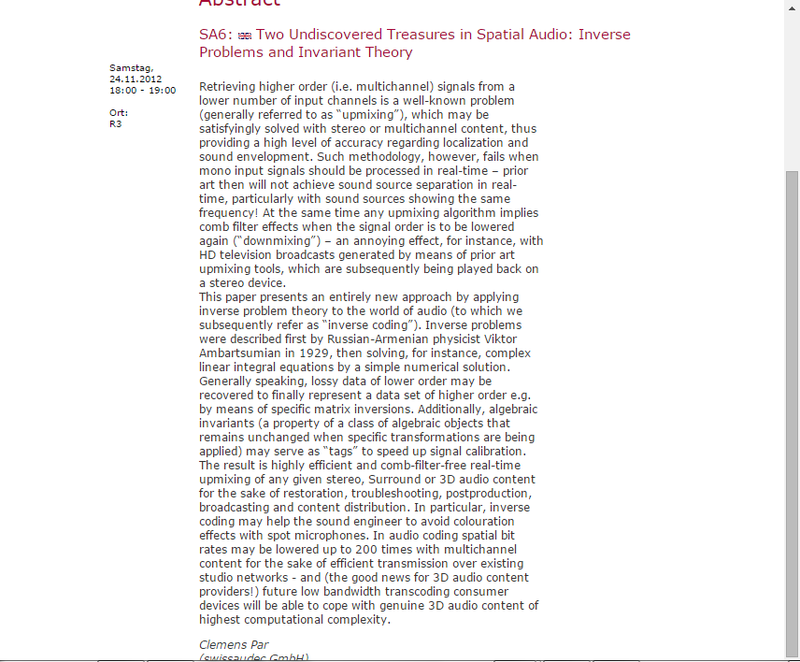 The paper will be delivered in English on Saturday, 24 November 2012, Spatial Audio, 18:00 - 19:00, Room R1. This 2011 White Paper by Theile and Wittek outlines the possible directions for 3D audio sound, where 3D means direction, distance and height. It reviews the limitations of 2.0 stereo and 5.1 surround due to phantom source instability and practical setup implementations. Described are different 3D rendering systems for playback and microphone setups for recording. This is a very interesting survey of what we have today and what might be the n-channel future. I am still amazed of what can be extracted in natural sounding spatial information from a properly done 2-channel recording. See Watson. A German version of the paper is available at www.hauptmikrofon.de and much more. Martin Mallison, Chief Technical Officer of ESS Technology, lucidly presented and explained the technical issues at RMAF 11. I do not doubt that people can hear Sigma-Delta noise shaping differences or digital jitter, though I have no personal experience. But I question his explanations as to why they are audible. Data measured in the frequency domain were not related back to the signal's nature and its amplitude in the time domain and vice versa. In general the vertical axis of the measurements was not discussed. In Fourier analysis the axis is calibrated in sinewave amplitude, but it is also used to read the amplitude of impulsive signal spectral components and of noise. Both are broadband signals that often exceed the bandwidth of the Fourier analyzer. To understand their amplitude presentation one must know the analyzer's impulse bandwidth and noise bandwidth. The spectral components of an impulse may be of very low amplitude, but in the time domain they add to a large, very short duration pulse with a repetition rate corresponding to the spectral line spacing. Similarly the amplitude of the same noise in the time domain is a function of the hearing bandwidth, e.g. 20 kHz. 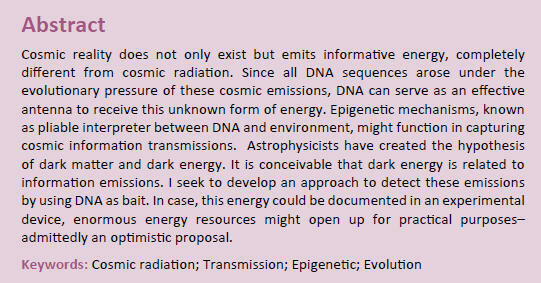 We hear both in the time domain and the frequency domain so we should also analyze physical processes in both domains. The audibility on the Rebecca Pidgeon track apparently is due to the impulsive signals from metal beads. Jitter is different. Jitter causes non-linear distortion, i.e. intermodulation of broadband signals. I doubt that this is what we hear because of its low amplitude. But jitter has a spectral distribution, which should have been shown in addition to its PDF. I believe that it is the very low frequency spectral content of the jitter, which typically has the highest amplitude, that accounts for audibility as phase modulation of the audio signal in the time domain. Again proper amplitude calibration of the analyzer is important to arrive at a meaningful interpretation of the numbers. The European Broadcasting Union defines In section 3.2 of this EBU-Technical Review article from 1997 a set of subjective parameters, which cover the technical quality of “acoustic music”. This set should be very useful for recording engineers in assessing their work. The demonstration CD PEQS, described in EBU-TECH 3287 (October 2008), gives 66 examples of different recording quality. The LX521 Monitors readily show the differences. EBU-Tech CD files. I have admired the exterior design of Braun products under Dieter Rams' leadership. 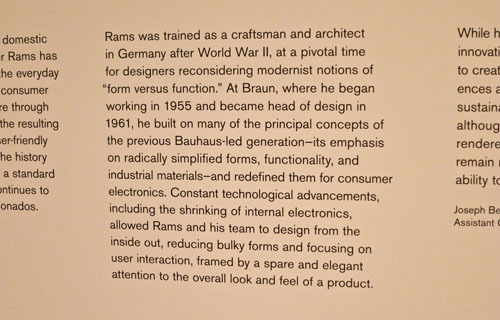 The SFMOMA has currently (January 2012) an exhibition of his work and also of his influence upon other designers (e.g. Steve Jobs & team). 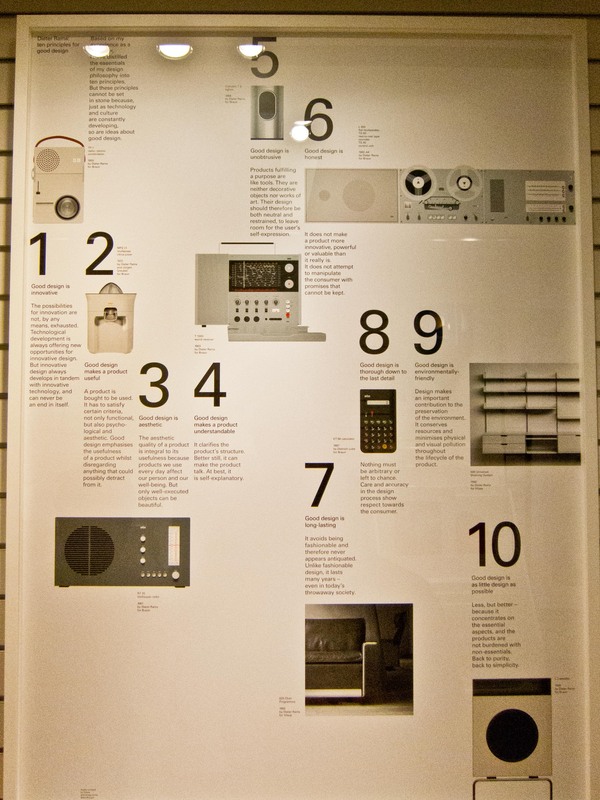 Follow the link below to his 10 Design Principles as shown on a poster in the museum bookstore and along the walls of the exhibition. 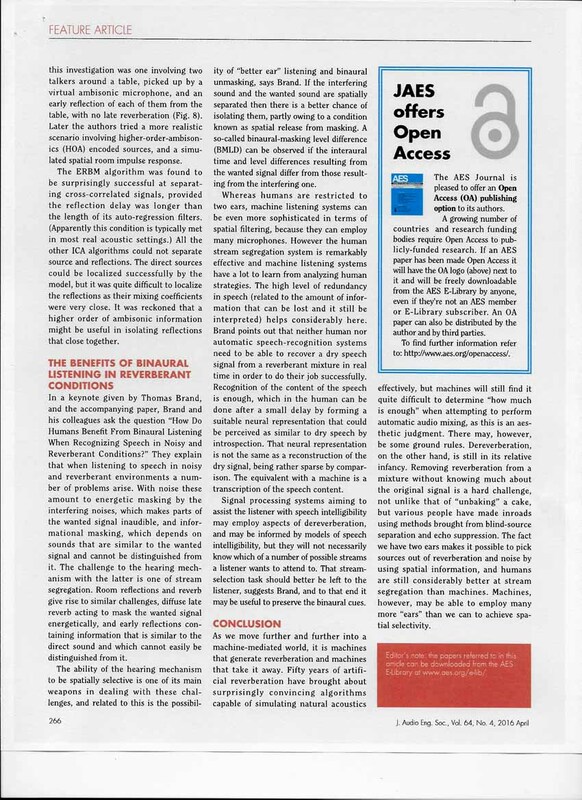 Stuart Yaniger describes the methodologies and pitfalls of listening tests in Volume 2 of Linear Audio, p.161-174. Myself and others, notably Don Barringer, have done a lot of listening tests to fine-tune the ASP response of the ORION, which was derived from free-field acoustic measurements. This is clearly a subjective process because what I and others hear is not merely a function of the sound pressure streams at our ears, but also of our expectations and the sonic attributes we pay particular attention to. We may come to agreements, if we have the same reference sounds in our minds, but this does not necessarily guarantee that we have developed a neutral transducer. Stereo is particularly tricky because we create a phantom sound scene that only exists in our minds. It is a good magician's trick, if we can hide the loudspeakers and the listening room in the process. And when have we reached YOUR perceptual noise level, where you are no longer sure that this way or that way is more accurate? I only know when I have reached MY perceptual noise level, but it is not fixed in time and can change with new expectation and attention. Do I then start over? In the end could I fool a child or dog? Karlheinz Brandenburg of Fraunhofer Institute and MP3 fame explains the perceptual coding and decoding of sound in this 17th AES International Conference paper from 1999. Though audiophiles often malign these compressed and lossy data formats I have found that many of today's Internet Radio broadcast stations have very satisfying sound quality and provide interesting classical music and culture programming. I use a Squeezebox as signal source and an iPod to control it remotely. What looks like a complete list of suppliers of high-resolution music files can be found on the auraliti website. "Norway is blessed with many churches and cathedrals and most of 2L's recordings are made in these wonderful spaces. The music captured by 2L features Norwegian composers and performers, and an international repertoire reflected in the Nordic atmosphere." Check out www.2l.no for downloads of high-resolution sound files. "Founded by David and Norman Chesky of the audiophile-record label Chesky Records, HDtracks is a high-quality music download service offering a diverse catalog of independent music from around the world. HDtracks does not believe in DRM, and as a result, we offer a selection of unencrypted files that play on any computer or portable device. Finally, audiophiles take note. HDtracks offers select titles in ultra-high resolution 96khz/24bit files. This is true DVD-audio sound quality for music lovers that demand the very best!" "North America’s classical music magazine covering people, places and events; recommendations of recordings, books, and film; and all the many ways our lives are touched by classical music. Published by ArkivMusic, the Source for Classical Music." Fundamental aspects of spatial hearing in humans are studied by Edgar Choueiri in the 3-D Audio and Applied Acoustics Laboratory at Princeton University. One of the projects deals with optimal cross-talk cancellation of loudspeaker stereo signals at the listener's ears. The process works optimally in a room without reflections (anechoic) and for binaurally recorded material. Coincident and near-coincident 2-microphone recordings benefit also. Coherent spatial information is usually lost in mixed-down multi-microphone recording and cannot be recovered by cross-talk cancellation. I guess that playback in reverberant spaces is optimized when using loudspeakers with frequency independent radiation patterns such as omni, cardioid and dipole, together with a symmetrical placement of the loudspeakers relative to large reflecting surfaces and at least 1m away from them. This would be the same setup as for traditional stereo playback in acoustically small spaces. A report about research into the auditory brainstem response to complex stimuli (cABR) in the June 2011 issue of Physics Today. Hearing involves a bi-directional stream of information - from inner ear to brain and from brain to inner ear. Note that the brainstem response to a 0.1 ms impulse shows activity for about 7 ms. Listen to three examples of naturally produced sounds contrasted with their brainstem responses at the end of the report. While not much about audio www,khanacademy.org surely has something to teach or to catch up upon for everyone. See for example his 10 minute talks about Specular and Diffuse Reflections or about Wealth Destruction. Vincent Kars' introduction to computer audio provides a wealth of information and links to suppliers for setting up a playback system where your music collection resides in computer memory. Seeing the different acronyms and terms explained and compared is very helpful. For many audiophiles it is like learning a new language. See also the dCS Guide to Computer Audio for assembling a playback system. Elias Pekonen measured and compared the response from a dipole bass loudspeaker to that of a monopole (box) loudspeaker in an acoustically small room using constant Q periodic wavelets. He observed that the dipole source better preserves the modulation envelope as shown very clearly in the frequency-time-amplitude data presentations on his website. The work confirms my own conclusions from shaped tone-burst tests (Publications #21) and those of Holland, Newell, Mapp in "Modulation Depth as a Measure of Loudspeaker Low Frequency Performance", Proceedings of the Institute of Acoustics, Vol.26, Pt.8, 2004. With the Toneburst CD you can hear changes in bass envelope modulation for different locations in your listening room. You can also sift through the questions, opinions, misunderstandings, irrelevancies, insights and selfassertions of the related diyaudio.com forum discussion. I hope that the time response in the discrete mode frequency range of a room will eventually get as much attention as the steady-state frequency response. Bass sound perception is derived from both. The second issue of the semi-annual bookzine has just been published and is available from www.linearaudio.net. It continues the collection of thought provoking and practical articles written by experts in various branches of audio. For example, I found the article on "Low-noise microphone preamp design" and "The F-word - or, why there is no such thing as too much feedback" particularly interesting. Check out the content. What is published here is too practical for the scientific paper ambitions of the JAES and far outside the range of Stereophile and TAS. Decades ago Wireless World was the place for this kind of audio engineering thought, but not that magazine's main topic. Graeme Huon from HUONLABS in Australia presents a sound reproduction system that conveys not only direction but also distance of acoustic sources. It is based on the premise that we hear the curvature of the arriving wavefront. I am not convinced, but here is a series of short articles that explain the concept. Also shown is a loudspeaker design with omni polar response obtained from controlled diffraction plate (CDP) structures, which are claimed to accurately combine the outputs from multiple drivers on a spherical surface. Leo de Klerk, a Netherlands artist and recording engineer, proposes a vertical array of 4 loudspeakers, (Lbottom + Ltop) & (Rbottom + Rtop), to produce a center phantom scene from a stereo recording that will not shift for off-axis listening angles. The loudspeakers should be omni-directional. Bottom and top loudspeakers receive the same input signal. I have not heard such configuration. An excited listener to my Pluto 2.1 demo at the TMT26 was trying to get Leo de Klerk to come and meet me, but our schedules prevented it from happening. Eric Weitzman started a new website and blog describing his Orion experience and modification, his Hubble Super Regulator, Balrog Turntable, and Curcio Phono Preamp to which you can leave replies. Rudolf Finke has on his website DIPOLE+ an article "Open baffle 1.pdf" that shows calculated on-axis and off-axis frequency responses of drivers on differently shaped baffles. In particular much attention has been paid to the transition region from 'dipole' response to 'dipolar' (beaming) behavior of practical size drivers. It is a well done study of trends and limitations. No wonder the Living Stereo series got such legendary reputation. 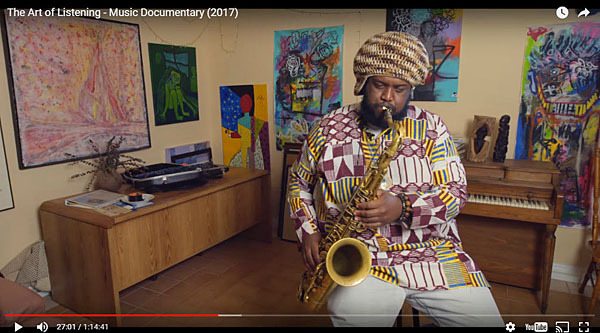 Check out the placement of the listeners and especially of the monitor speakers in the recording studio, well away from all walls (for example at 06:10 to 06:50). The entire room, which features dimensions larger than the typical studio of today, resembles acoustics more characteristic of a large living room than an over-damped studio (but often with lots of very early reflection from the huge mixer console in front of the typically flush mounted wall speakers). RCA placed the main microphones above and in front of the orchestra. What were the problems with recording directly from "the best seat"? Could such recording be done with modern microphones like a pair of Schoeps SuperCMIT and capture the timbre, localization and spaciousness as heard from "the best seat"? What is the recording engineer's goal today? 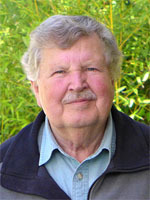 Eberhard Sengpiel was honored in 2010 by the Verband Deutscher Tonmeister (VDT) for his contibutions to the Tonmeister (~recording engineer) profession. His website contains a very extensive compendium of lecture notes (example) for recording engineers. But I found nothing about issues or solutions to stereo playback in reflective spaces, which the vast majority of consumers have to deal with. Why are there no lectures about the all-important "Wiedergabetechnik" (Playback Techniques)? Why no discussion of the influence of the "Mono Recording Angle", which captures sound outside of the stereo recording angle? Clemens Par creates professional three-dimensional sound from one single audio channel. He thereby saves 50% up to 88% of the audio signal bandwidth and, vice versa, enhances any audio data to a professional three-dimensional sound image. I was impressed by his demo at TMT26, but how could he do it? H. D. Harwood from the BBC Research Department talks in this landmark Wireless World article from 1976 about observations and unresolved issues related to loudspeaker design. On page 48 he questions the optimum on-axis frequency response and mentions a shallow dip between 1 kHz and 3 kHz. On page 54 he pleads for a non-uniform axial frequency response. Experiences with equalizing an initially flat on-axis response to obtain the realistic sounding ORION-3.2 have convinced me that 'flat' is not correct for a stereo system. Here we must create believable phantom sources from two real sources at +/-30 degree angle to the listener, at the 'sweet spot', in the room. Nor is the BBC dip the answer. Instead, the response must be flat above 100 Hz and then gradually drop to a lower level at high frequencies. There are general physical and psychoacoustic requirements for such a response, which I will explain at a later time. A specific on-axis frequency response curve is usually the secret behind a good sounding loudspeaker. The marketing department likes to label this curve 'flat'. For Stereo, neither the two monitor loudspeakers in the recording studio, nor the playback loudspeakers in the home, should have a flat on-axis frequency response. A corresponding power response and placement of the acoustically small loudspeakers in the room at least 1 m away from large reflectors, hides both loudspeakers and room acoustically from the listener in the 'sweet spot'. Application Note 100 from Hewlett Packard Co. marks the company's short-lived entry into the acoustic measurement field in 1968. The flagship product was the Zwicker Analyzer for loudness measurements. AN100 contains fundamental and useful information in its 116 pages (9MB) such as physical acoustics, physio-psychological acoustics, survey of measurement methods, instrumentation, calibration of microphones, sound level meters, filters, frequency analysis, standards. Here is a truly ground breaking, sensible and practical application of DSP to the design of crossover filters and the polar response of large multi-way active loudspeakers. Very exciting work! It avoids lobing of the vertical polar pattern. The Audio Toolbox by Dr. Ulrich Brüggemann (((acourate))) now includes these crossover filters. John Watkinson from Celtic Audio Ltd. presents his observations and theories in a thought-provoking paper. I see many parallels to my work, in particular his emphasis on minimal diffraction, i.e. omni-directional radiation and the consistency of the reflected with the direct sound spectrum. He emphasizes the necessity for linear phase response and waveform fidelity for localization and spatial accuracy of phantom sources. I have not found or heard convincing evidence for this, if phase/ group delay distortion is kept low. Linear phase can only matter for instantaneously broadband transient signals. The highpass nature of loudspeakers, though, requires 12 dB/oct low frequency response for minimum group delay build-up, not vented enclosures. The Cabar stereo monitor loudspeaker system bears many similarities to a pair of Pluto 2.1. I designed Pluto because I wanted to compare a low diffraction, acoustically small source to Orion, which led to the rear tweeter addition in Orion+. D. B. 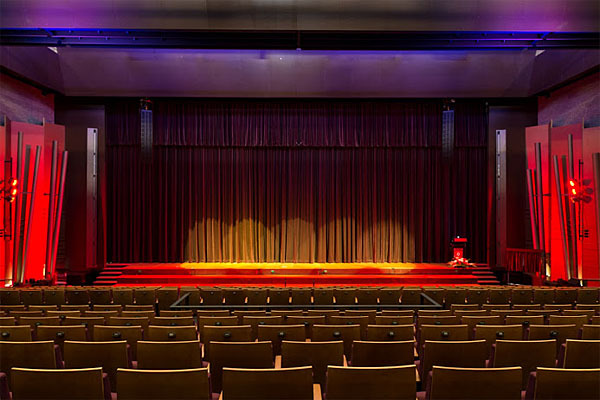 (Don) Keele has done extensive work on line array loudspeakers for sound reinforcement applications, where it is important to control the vertical radiation pattern and to avoid lobes, while maintaining wide horizontal dispersion to cover an audience. In a curved array with proper shading the delay of individual drivers is obtained mechanically and the output level from groups of drivers in the array is changed independent of frequency and only according to their placement in the array. The joint paper with Douglas J. Button describes straight and curved arrays and compares their vertical radiation pattern to that of a 2-way loudspeaker over a ground plane. The paper is rich in graphical illustrations. An introduction to the CBT and its application is given in Don's Boston AES-ASA-BAS presentation from January 2010 with overheads and accompanying audio/video (Don Keele.mov). I have heard Monte Kay's center speaker CBT and was quite impressed with its acoustic performance in his home theater application. It seems the CBT in its various forms presents a business opportunity for highest quality sound reinforcement, where especially the mid and high frequency portions of the spectrum must be properly dealt with. It would be the end of the horn and compression driver in quality critical applications. The Bruel & Kjaer Library has a collection of their Application Notes, Technical Reviews, Primers, Handbooks, Conference Papers and a Dictionary. It is a treasure chest of information about acoustic and vibration measurement methods and tools. I desired but could not justify a product purchase from B&K, but I was an avid collector of their publications. Here now is everything in one place and conveniently accessible. David Griesinger places emphasis on the streaming behavior of sound as he explains perception of direct and reflected sounds in a surround recording context. Intelligibility, reverberance, distance, and mud are his major concerns. Unlike for Theile and Wittek below, the placement of phantom sources in a coherent spatial continuum is of less concern. He states, though, that "Recordings stand or fall on their ability to satisfy the needs of human hearing. This is constant among people, even among recording engineers." He may not be aware how much is revealed about the recording technique when a loudspeaker system like the Orion is used to evaluate the plausibility of the auditory scene that is heard. Guenther Theile discusses techniques for recording music when natural reproduction over 3 front loudspeakers and 2 surround loudspeakers is desired. The perceptual effects that are generated by 5-real and n-phantom sources depend upon the microphone configurations used. Curiously, the potential influence of loudspeaker radiation pattern and room reflections upon spatial sound reproduction is not considered. Wittek below, makes the same omission. Chapter 3 of the above PhD Thesis from Helmut Wittek contains a wealth of information about the properties of stereo, about phantom sources and perception models. Chapter 2 is an introduction to the perceptual attributes that apply. Dr. Helmut Wittek is the Managing Director of Engineering for Schoeps Mikrofone in Germany. Jens Blauert discusses perception, reality and virtual reality in this paper from the 2nd International VDT Symposium on 'sounddesign', 2007, in Germany. The paper is also interesting in relation to my proposed tests for the accuracy of a stereo system by concentrating on the plausibility of the reproduced Auditory Scene and the abstraction level of the character of the reference that is implied in such tests. Even though it is well known that prolonged exposure to loud sounds produces hearing damage, it is very common that people listen at dangerously high volume levels. Barry Blesser attempts to explain the phenomenon in this article. An informative blog about loudspeaker evaluation and test methods at Harman International (JBL, Infinity, Revel). Sean is the Director of Acoustic Research. A timely overview of what is happening in the audiophile world. Some interesting articles from BAS Speaker and other magazines. It could be worthwhile to be on the mailing list. On the exhibit floor of the 129th AES Convention in Munich I saw a loudspeaker that impressed me by the logic with which it was designed, the GRIMM AUDIO LS1. I could not listen to it closely because the surrounding noise level was far too high, but what I saw and heard from the exhibitors convinced me that the LS1 is a remarkable loudspeaker design. The wide baffle yields a forward pointing and smooth polar response over a very wide frequency range with a low frequency transition region to omni-directional behavior. The inside of the box and the panels appeared to be properly designed. The speaker is active and uses intelligently applied DSP for response correction. A subwoofer can be correctly integrated if needed. One can only hope that the LS1 breaks bad habits in recording studio and home. A very closely spaced loudspeaker pair with head related cross-talk cancellation that produces a virtual acoustic environment. This and other interesting work from the Institute of Sound and Vibration Research at the University of Southampton, UK. An enormous construction project that has been in the works for a number of years. I am already certain that when finished it will have outstanding sound performance. In this book Floyd Toole summarizes and explains conclusions from a lifelong involvement with audio. I highly recommend it to anyone interested in factual information about loudspeakers and listening rooms, about measurements, listening observations and their practical implications. It is lucidly written in easy to understand language, extensively illustrated and referenced. It deals with the reproduction of sound - which existed in a space - inside another space. My only regret is that the potential of 2-channel playback in doing so has not been fully explored and misrepresented. This is understandable because the conventional box loudspeaker with its frequency dependent directivity index has been used for almost all of the observations that are discussed. In fact, the particular interaction of a box loudspeaker with the listening room makes it more difficult for our ear/brain perceptual apparatus to hear the recording venue's space and acoustics, provided that such information has been captured in the recording process. Floyd focuses on multiple loudspeaker surround sound. He considers this approach to spatial sound reproduction as much more rewarding and he provides extensive practical information for that. The book is very comprehensive and in my opinion a "must-read" for loudspeaker designers, recording and mastering engineers, room-acoustic consultants, audio reviewers and audiophiles. The book is about theory and praxis. It debunks much of the BS that seems to have permeated the audio industry and many of its customers. The first open baffle loudspeaker? Transactions of the American Institute of Electrical Engineers, issue 44, 1925, pages 461-475.
to the front of the diaphragm. Both helped to bring out the low tones and gave rise to some resonant effects. Bringing out the low tones was due principally to preventing circulation of air between the front and back of the diaphragm. The resonance was in the horn in one case, and in the box in the other. do about as much harm as resonant cavities in front of the diaphragm, the diaphragm usually taking part in the resonance. Attempts to damp the interior of the box with felt were not entirely successful. as that radiated when the back of the diaphragm is enclosed." This is probably the first description of an open baffle loudspeaker. ".... cabinet set containing rectifier, amplifier and loud speaker. The front of the cabinet acts as a baffle. To prevent air resonance in the box, the sides and back are vented by inserting panels of perforated brass." The first active loudspeaker as well? "Resonanzfrei durch dicke mit Mineralwolle isolierte Doppelwände. Dipole PA loudspeakers from Telefunken at the 1936 Olympics. "Die Entwicklung des dynamischen Lautsprechers scheint schon seit mehreren Jahren so ziemlich zum Abschluß gekommen zu sein. Man sieht deshalb wenig Neues. Nach den Angaben der Aussteller bemüht man sich zur Zeit vor allem darum, die Feldstärke im Luftspalt zu erhöhen, um die Empfindlichkeit zu steigern und um, was erheblich wichtiger erscheint, die Haupteigenschwingungen der Membranen zu dämpfen. ...."
A paper about audio measurements by Henning Moller of test instrument maker Bruel & Kjaer. The information is technically sound, but the measurement applications are dated. The paper is very educational, particularly for those in the DIY community who lack measurement capability, especially for free-field acoustic measurements, and instead rely on computer simulation and their ears. That is a very limiting method for designing loudspeakers and guarantees sub-optimal results if the goal is accurate sound reproduction. A joint paper by J. Gerhard, B. Theiss, M. O. Hawksford from the 1996 AES Convention in Copenhagen (Preprint 4246). Their loudspeaker layout is quite different from the ORION++, but similarly based on psychoacoustic observations. I suspect that their listening experience could have been even more convincing, if omni-directional loudspeakers had been used. Those would have increased the reflected energy from the wall in front of the listener over the energy coming from the side walls. That would have reduced the need for micro placement of speakers and listener to 0.5" (12 mm) accuracy without affecting imaging precision. A setup of loudspeakers parallel to the long wall of the room and close to the listener would seem to be well suited for small rooms and the PLUTO. It could also easily fulfill the minimum distance requirement of 3' (6 ms) from any wall. Close listening distance to the speakers also reduces the magnitude of floor and ceiling reflections if that should matter. Bob Pease is a legend in electronic design. In the Pease Porridge column of Electronic Design magazine he often talks about audio related electronics. For example, "What's all this best stuff, anyhow?" shows an easy way to measure operational amplifier distortion and noise by analyzing the amplified error voltage. In "What's all this Sallen-Key stuff, anyhow?" he points to the influence of the frequency dependent output impedance on filter roll-off performance. Bob highlights many design issues and deepens understanding of circuit and component behavior. 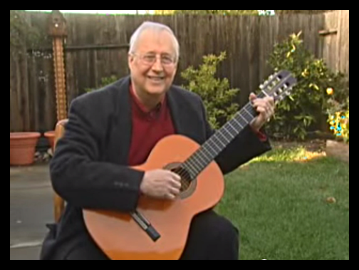 Floyd Toole presented a tutorial on this subject at the New York AES Convention in 2005. Here is a summary as taken from the March/April issue of Multimedia Manufacturer Magazine. It appears that his latest findings match more closely my own observations and experiences which had convinced me that uniformity of directivity over a very broad frequency band, such as from omni-directional and dipole radiators, is optimal for accurate sound reproduction in typical living rooms. See also related earlier publications below and my Letter to the Editor of TAC. A comprehensive review of this subject has now been published in the June 2006 issue of the Journal of the Audio Engineering Society by Floyd Toole, "Loudspeakers and Rooms for Sound Reproduction - A Scientific Review". Highly recommended study material for what is known and what needs further investigation. A relatively new field of study which should lead to further understanding of the listening room's role in audio playback. I highly recommend to take a close look at the work of Albert S. Bregman, "Auditory Scene Analysis - The Perceptual Organization of Sound", MIT Press 1990. In a different application this material has already led to greater audio data compression rates but with fewer artifacts. There is an Audio CD available with 41 demonstrations of Auditory Scene Analysis. 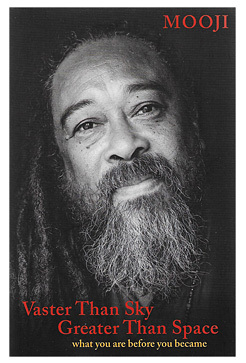 The included booklet gives a very clear introduction to the subject and detailed descriptions of the demonstrations. Quality in the Age of "Good Enough"
Blair Jackson, MIX Magazine's senior editor writes about the recording business in the May 2005 issue. Loudspeaker and listener positions for optimal low-frequency spatial reproduction in listening rooms. David Griesinger of Lexicon argues and demonstrates that realistic bass reproduction requires more than a flat steady-state frequency response in the room. He points out the importance of the randomly varying pressure gradient between the ears, the velocity field vector, for spatial envelopment. The now widespread listening experience with dipole woofers, which set up strong velocity fields, confirms his observations. See also my Publications (21), (1) and Issues in speaker design - C.
Learning to listen in a mediated world. An interesting article in the June 2005 issue of MIX magazine which talks about our auditory references. Paul Falstad has written and collected many interesting Applets. His Ripple Tank Applet shows numerous acoustic and electric wave propagation phenomena in an infinite plane and in a bounded plane. Of particular interest are visualizations of the wave fields for point and dipole sources when walls introduce reflections. Note that for acoustic waves the Fixed Edges check box must stay unchecked at all times. Select a very low source frequency so that the wavelength is in the order of the wall length to see what happens in a room at low frequencies. Place the source in different locations. Vary the distance between the (+) and (-) dipole sources. Focus on a fixed point in the plane - the listening position - and observe the sound pressure variation with time relative to that of the source. Check out the 3-D View and rotate the plane. All this should give you an idea about the complexity of sound propagation in acoustically small spaces where room modes dominate. Then increase the Source Frequency and Resolution to their maximum to see the essentially random reverberant field behavior above the Schroeder frequency. A thought provoking article about the information capacity of loudspeakers and how it might be measured. The mp3 encoded tracks on my Demo CD give you an idea about your own sound system's information capacity and/or your hearing ability. The books by John Watkinson are highly recommended. 'The Art of Sound Reproduction' should be required reading for every audio equipment reviewer. The November 2004 issue of the Scientific American carries an article about what happens in the brains of listeners and musicians. A very readable and thorough review from Physics Today , November 1999, of how we use our ears and mind to localize sounds. If you are interested in knowing what can be done to the recorded sound before the bits are committed to a CD, then you should read a few chapters in this book. It was written by Bob Katz, a well known and respected mastering engineer. Critical technical content has been checked by Jim Johnston, formerly of Bell Labs/AT&T. We tend to judge speakers by our favorite recordings without fully realizing how much the signals may already have been processed to suit commercial interests. 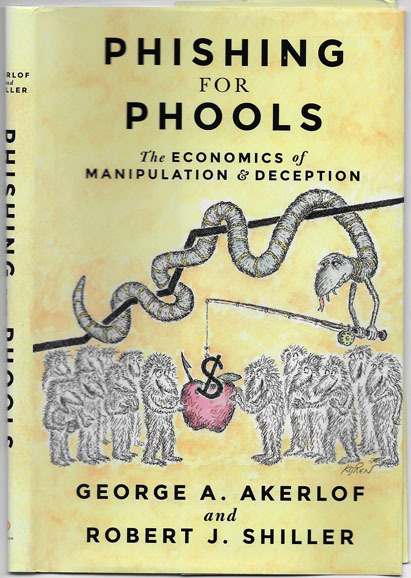 Highly recommended reading and very educational. Different techniques have been used to reduce the transfer of vibration energy from a loudspeaker driver to its cabinet. I like to mount the driver by its magnet and to let the driver basket rim touch the baffle only lightly so that little force is transmitted. It is effective and easier to implement reliably than compliant mounting from the rim. The PHOENIX and ORION Revision 0.1 driver attachments are examples of this. In a box design I had rested the magnet in a cradle and clamped it with a metal strap, which could be tightened from the outside using long screw-bolts. Note the description of the listening tests. Trained listeners are used, but what is their reference? Neutral sounding pink noise? Live acoustic sounds? Speakers are compared against each other in double blind preference tests. How accurate is the preferred speaker? Note the listening room with diffusers. Certainly not what most people will use. Kevin Voecks clearly states the importance of timbre due to direct frequency response, 1st reflection and power response, the importance of polar response to 60 degrees off-axis horizontally. He points to the listening room as the biggest problem. The need for multiple woofers to combat modes. These are areas where an open baffle speaker like the ORION has clear advantages due to the figure-of-eight polar response down to the lowest frequency. Thermal compression in drivers and the associated response changes due interaction with the passive crossover elements are non-issues in an active speaker. No mention is made of other nonlinear distortion tests. The importance of reducing resonances (stored energy) is highlighted, but no mention of how Revel tames the cabinet vibrations or the sound inside the cabinet. Revel certainly has all the resources one could ever wish for and their top speakers probably define the performance plateau that can be reached within the box speaker paradigm. See also http://www.reed-electronics.com/tmworld/article/CA475937.html for related speaker design targets of the Harman team. The psychoacoustics of multichannel audio - Robert Stuart of Meridian Audio Ltd gives a tutorial about the different psychoacoustic parameters that influence sound perception in single channel and multichannel sound reproduction. Little of the material is immediately useful other than to point out the complexity of the processing that happens between our two ears. It can be expected that multichannel sound has less masking than mono or stereo, though this depends heavily on how the different channels were recorded and processed. Given the great variability of stereo recording, which should be a stable technology by now, it needs to be seen how well multichannel will do when there are no standards for recording technique nor playback equipment performance. For example, neither the SACD or the DVD-A consortium, nor any multichannel receiver manufacturer, specifies the low frequency roll-off characteristic of the multiple loudspeakers to be used, which is absolutely necessary to know for proper bass management. Following merely the installed Home Theater practices will hardly reveal the full potential of the new sound recording media. See also my comments and Publication 19. Ambiophonics - Interesting material on acoustics and psychoacoustics that is well presented by Ralph Glasgal. This type of reproduction system requires a dedicated room and is capable of a convincing sonic experience. Yet, it does not fit my life style and there is something about it that I find tiring upon extended listening. Reference earphones - My motto is "True to the original", which means true to what has been placed on the storage medium be it CD, DAT or whatever. Every electro-acoustic transducer introduces distortion, with loudspeakers being the worst offenders. Etymotic Research ER-4S earphones come the closest to reproducing what was recorded and they can serve the very useful purpose of identifying the areas where a given loudspeaker is failing. The accuracy of these earphones can be significantly improved by inserting a simple passive equalization network into the electrical signal path. It is very illustrative, but possibly disconcerting to hear, how a loudspeaker is distorting in frequency, time or dynamics. For example, take track 2 of Deedee Bridgewater's Live at Yoshi's CD and listen to the range of her voice, the drum set, the background sounds, etc. If you are not using dipole bass speakers you will be surprised to notice the sound that your boxes and room contribute to what you hear. The earphones can be a reliable reference for comparing frequency response, transient response and dynamics. I have some trouble with unnatural in-head localization, the lack of any tactile sensation of sound, and pushing a plug into my ear canal, but at 10% of the cost of the ORION they are a most worthwhile investment in accurate sound reproduction. 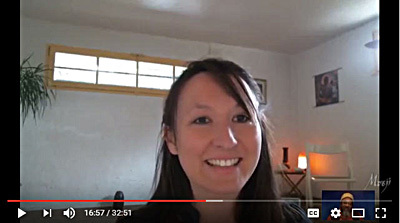 MP3 interview with John Sunier for Audiophile Audition. Hear me talk about some of the loudspeaker features that are most important for realistic sound reproduction. Audio Artistry - The company builds a line of open baffle, dipole loudspeakers that I designed. The Beethoven-Elite and Beethoven-Grand are 4-way active systems that incorporate my latest thinking in speaker design. The two models evolved from the bi-amplified Beethoven. A review of the Beethoven is available in the Stereophile Archives. The beginnings of the Dvorak series are described in my 1992 AES paper about a compact dipole design. The Vivaldi is a 3-way system and demonstrates the high level of performance that can be obtained even in a fully passive dipole design. The frequency dependent cancellation of front and rear radiation is a good challenge when designing for a flat on-axis and off-axis response down to the bass region. 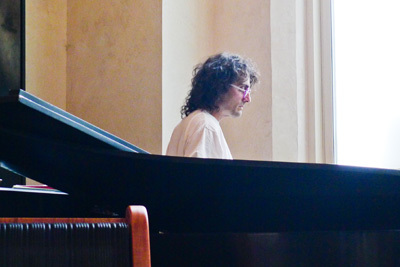 Shannon Dickson interviewed me for Stereophile Magazine, (Vol.19, No. 4, 1996). I give a little history of how I got involved in audio and what I am trying to accomplish. 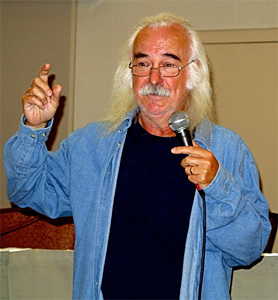 His article is reprinted on the Audio Artistry web site. Here he is in his home in Hawaii with his Audio Artistry Beethoven-Grand. Gradient - Here are loudspeakers developed by Jorma Salmi. His observations and thinking about the room-speaker interaction are very parallel to mine. KLIPPEL - Measurement and modeling of large signal parameters of drivers and simulation of their effect upon distortion. Highly educational material that applies especially to drivers for use in open baffle woofer designs, which require large volume displacements. See, for example, Wolfgang Klippel's 109th AES Convention paper , "Diagnosis and Remedy of Nonlinearities in Electrodynamical Transducers". "Rules of the Game" by James Boyk - Lecturer in Music in Electrical Engineering, California Institute of Technology. Is Digital Audio perfect? This article is an excellent look at human perception when trying to evaluate new versus old technology. 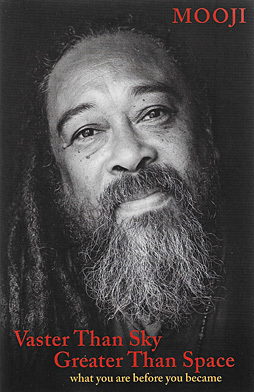 "....Then we must judge the New, not against the Old, but against the ultimate purpose of both. In audio, this means either a bypass test with a high-quality direct feed identified to the listener, or, if possible, a comparison with the live sound...."
"The Music of Sound" is about differences in listening and a reminder that a loudspeaker must be able to reproduce the most subtle sonic details in order to convey music's emotional message. David Griesinger's work on sound envelopment is required reading for anyone interested in a music surround system. The popular home theater setups for movie viewing provide mostly pan-potted five channel mono sound, which works effectively because of the dominant cues from the picture screen. Music surround requires different recording techniques and playback processing to create a convincing illusion of spatial relationships. For an introduction to the issues involved study the preprint of Griesinger's talk at the Nov. 2000 Surround Conference in Paris. Also, study the insightful MS PowerPoint slide presentation, "Perception of mid frequency and high frequency intermodulation in loudspeakers, and its relationship to high-definition audio - A physicist meets the twilight zone". In addition to the ultrasound findings, I was particularly interested in his discussion of distortion in loudspeaker reproduction of massed chorus and orchestra, beginning with slide 39. These are the two types of signals that I find most critical for assessing speaker performance. They involve naturally occurring distortion in the ear, which is also present at a live performance. Are You On The Road To ... Audio Hell? 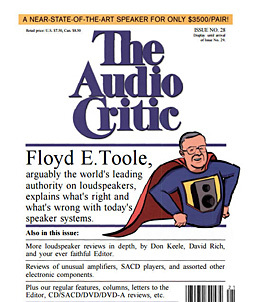 The problem of reviewing and comparing audio components in the absence of a reliable reference is discussed in this article from Enjoy The Music.com. I maintain that an accurate system will give you sonic surprises. Too many systems, though, impart a sameness to everything played through them and the sound experience becomes predictable. Acoustics Animations - Here are nice illustrations of the sound fields radiated by monopole and dipole sources. Open baffle, full-range circular array source - A box-less speaker construction for those with extra room for the rear radiation. I have no doubt that this approach has the potential for very accurate sound reproduction. Look at the many pictures if you do not understand Swedish. Subwoofers: Optimum number and location - Based on the assumption that a smooth steady-state frequency response in the room is most desirable this investigation by Todd Welti from Harman International develops practical monopole subwoofer layouts. In my experience the steady-state frequency response does not explain the qualitative difference in bass reproduction between monopole and dipole woofers. The low frequency transient behavior due to the active number of modal resonances in the room response must not be ignored. Additionally, the white paper "Getting the bass right" by Floyd E. Toole will give insight into practical ways for dealing with the steady-state response of the room.